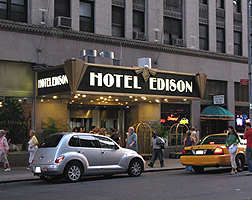 The Edison Hotel has an interesting history – the building was finished in 1931, and on opening day in New York, the hotel’s lights were turned on by Thomas Edison – via remote control, from his home in New Jersey! The hotel offers luggage storage at the beginning of your stay if your room is not available when you first arrive. Luggage storage after check-out is also available for a small charge. The hotel has a mural in the lobby – it spans across the room and is hugely interesting. Called the “Big Apple Birdseye”, it was created by artist Arnie Charnick – make sure you check it out before you leave!